Huangshan (simplified Chinese: 黄山; traditional Chinese: 黃山; pinyin: Huángshān; literally “Yellow Mountain“), is a mountain range in southern Anhuiprovince in eastern China. The range is composed of material that was uplifted from an ancient sea during the Mesozoic era, 100 million years ago. The mountains themselves were carved by glaciers during the Quaternary. Vegetation on the range is thickest below 1,100 meters (3,600 ft), with trees growing up to the treeline at 1,800 meters (5,900 ft). The area is well known for its scenery, sunsets, peculiarly shaped granite peaks, Huangshan Pine trees, and views of the clouds from above. 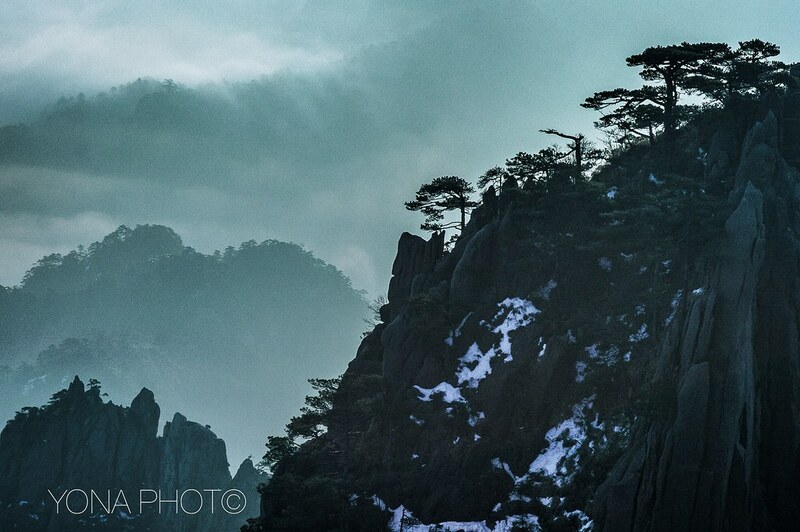 Huangshan is a frequent subject of traditional Chinese paintings and literature, as well as modern photography. It is a UNESCOWorld Heritage Site, and one of China’s major tourist destinations. 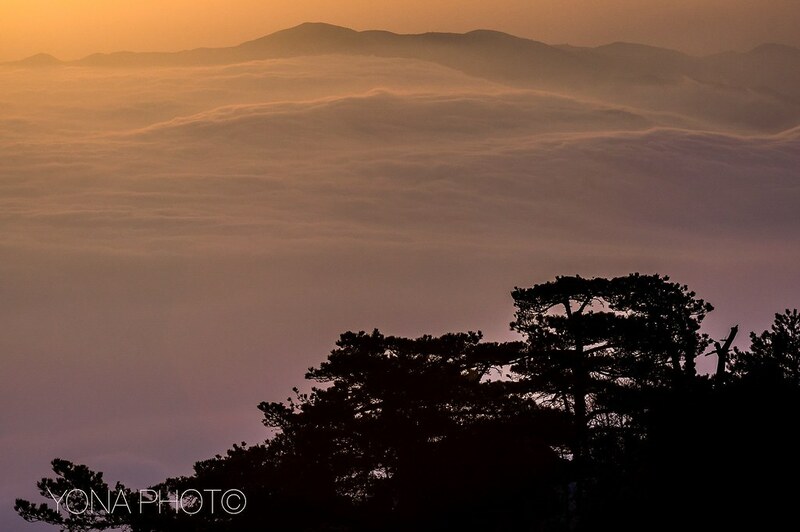 Huangshan is known for its sunrises,pine trees, “strangely jutting granite peaks”, and views of clouds touching the mountainsides for more than 200 days out of the year. 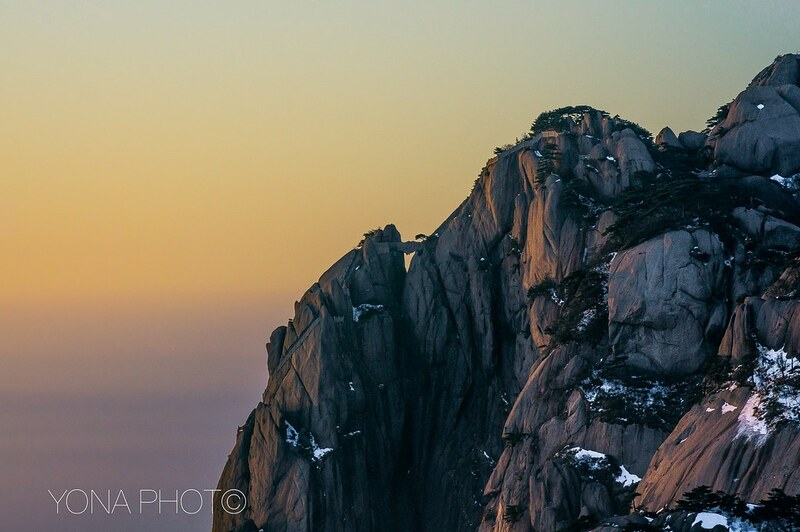 The Huangshan mountain range has many peaks, some more than 1,000 meters (3,250 feet) high. The three tallest and best-known peaks are Lotus Peak (Lian Hua Feng, 1,864 m), Bright Summit Peak (Guang Ming Ding, 1,840 m), and Celestial Peak (Tian Du Feng, literally Capital of Heaven Peak, 1,829 m). The World Heritage Site covers a core area of 154 square kilometres and a buffer zone of 142 square kilometres. The mountains were formed in the Mesozoic, about 100 million years ago, when an ancient sea disappeared due to uplift. Later, in the Quaternary Period, the landscape was shaped by the influence of glaciers. The vegetation of the area varies with elevation. Mesic forests cover the landscape below 1,100 meters. Deciduous forest stretches from 1,100 meters up to the tree line at 1,800 meters. Above that point, the vegetation consists of alpine grasslands. The area has diverse flora, where one-third of China’s bryophyte families and more than half of its fern families are represented. The Huangshan pine (Pinus hwangshanensis) is named after Huangshan and is considered an example of vigor because the trees thrive by growing straight out of the rocks. Many of the area’s pine trees are more than a hundred years old and have been given their own names (such as the Ying Ke Pine, or Welcoming-Guests Pine, which is thought to be over 1500 years old). The pines vary greatly in shape and size, with the most crooked of the trees being considered the most attractive. To enjoy the magnificence of a mountain, you have to look upwards in most cases. To enjoy Mount Huangshan, however, you’ve got to look downward. The area is also host to notable light effects, such as the renowned sunrises. Watching the sunrise is considered a “mandatory” part of visiting the area. A phenomenon known as Buddha’s Light (Chinese: 佛光; pinyin: fóguāng) is also well-known and, on average, Buddha’s Light only appears a couple of times per month. In addition, Huangshan has multiple hot springs, most of them located at the foot of the Purple Cloud Peak. The water stays at 42 °C all year and has a high concentration of carbonates, and is said to help prevent skin, joint, and nerve illness. During the Qin Dynasty, Huangshan was known as Yishan (Mount Yi). In 747 AD, its name was changed to Huangshan (Mount Huang) by imperial decree; the name is commonly thought to have been coined in honor of Huang Di (the Yellow Emperor), a legendary Chinese emperor and the mythological ancestor of the Han Chinese. 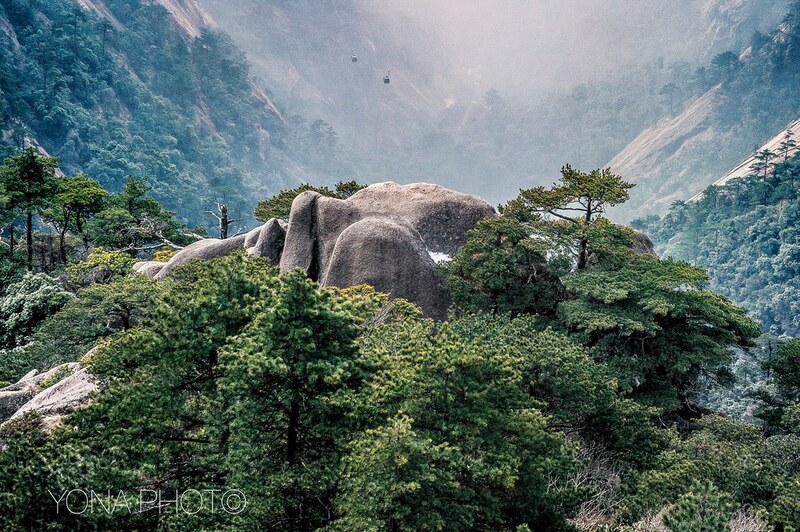 One legend states that Huangshan was the location from which the Yellow Emperor ascended to Heaven. Another legend states that the Yellow Emperor “cultivated moral character and refined Pills of Immortality in the mountains, and in so doing gave the mountains his name. 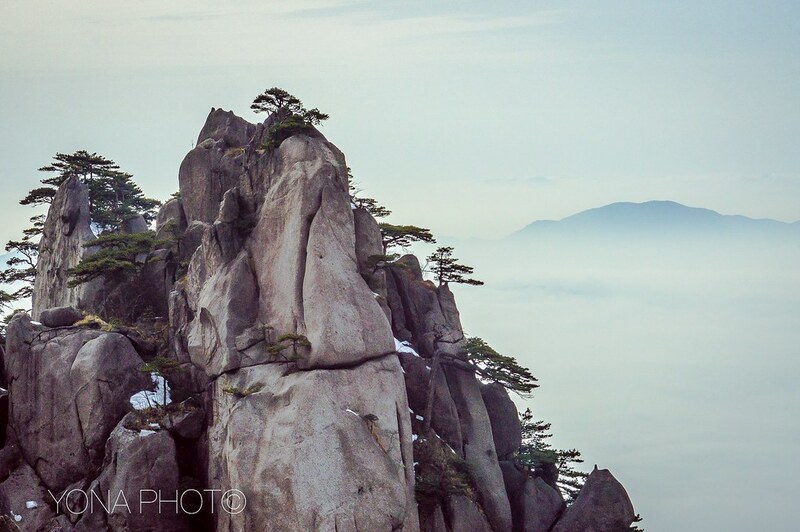 The first use of this name “Huangshan” is often attributed to Chinese poet Li Bai. Huangshan was fairly inaccessible and little-known in ancient times, but its change of name in 747 AD seems to have brought the area more attention; from then on, the area was visited frequently and many temples were built there. Huangshan is known for its stone steps, carved into the side of the mountain, of which there may be more than 60,000 throughout the area. The date at which work on the steps began is unknown, but they have been said to be over 1,500 years old. Master class photography here. Congratulations. Wonderful pictures and interesting information.